One of the treatments for wet macular degeneration is injecting the eye with medicine. This medicine has a good possibility of stopping the growth of new leaky blood vessels causing loss of vision. This will protect further loss of vision and maybe save precious reading and driving vision. Currently there are 4 different types of medicine: Avastin, Eyelea, Lucentis, and Macugen. These are all given by injection. The above picture shows a normal chart with straight lines. With leakage in the eye and progression of macular degeneration, waviness can occur right in the middle or anywhere on the chart. A blurry spot can happen anywhere on the chart. The blurry spot can develop into a black spot as the disease progresses. Without treatment, the area affected by macular degeneration can increase in size. If treated immediately, the area affected by the leakage might be stopped. One of the treatments is shots in the eye. Yikes! Even the thought of getting a shot right in the eye makes me feel a little sick. Or I should say, it used to. No more. Not since talking to Sharron. Sharron is a good friend with macular degeneration in one eye, her left eye. This diagnosis wasn’t a complete surprise to her because her mother had macular degeneration. If a parent has macular degeneration, it doesn’t mean a child will get it. But it does increase the odds. Because her mother had macular degeneration, Sharron used the Amsler Chart regularly to check her vision. Here’s the link back to an earlier post with the chart and directions how to use it. 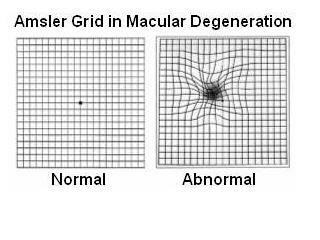 The Amsler Chart does not take the place of an exam by a doctor, but it can give an early warning when the eye changes. It was in July 2014. One morning I woke up and had a lot of blurring. Had I not worked with Mom for so long, I might have put off a little blurring and let a treatable situation get ahead of me. Sharron didn’t put it off. She went directly to her eye doctor. This is vital!!! Timing can be crucial. It’s so easy to put off the doctor thinking it’s age or time for a new pair of glasses. Let a doctor take a look and see what is going on. He said I needed specialized checking and made me an appointment for the following day with a retina specialist. My macular is the wet variety and when he said a shot in the eye, I was scared to death. To be continued in the next blog. Your questions about the shots might be answered then. If not, feel free to send your questions to me on the contact page and I will get the answers for you.